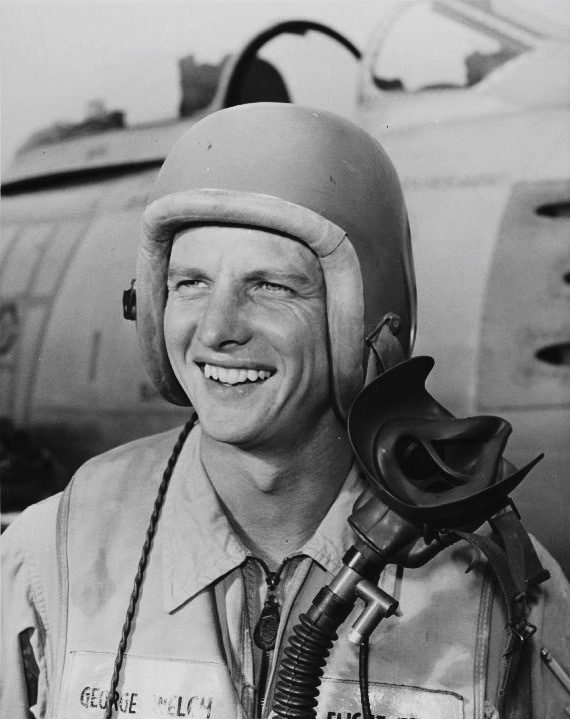 12 October 1954: North American Aviation Chief Engineering Test Pilot George S. Welch, testing the ninth production F-100A-1-NA Super Sabre, serial number 52-5764, made a planned 7.3 G pullout from a Mach 1.55 dive to verify the aircraft’s design limits. A Boeing B-47 Stratojet crew flying at 25,000 feet (7,620 meters) reported that Welch’s F-100 winged over and began a rapid descent, passing within four miles (6.4 kilometers) of their position and diving at a very high speed. The aircraft appeared to be under control but then suddenly disintegrated. 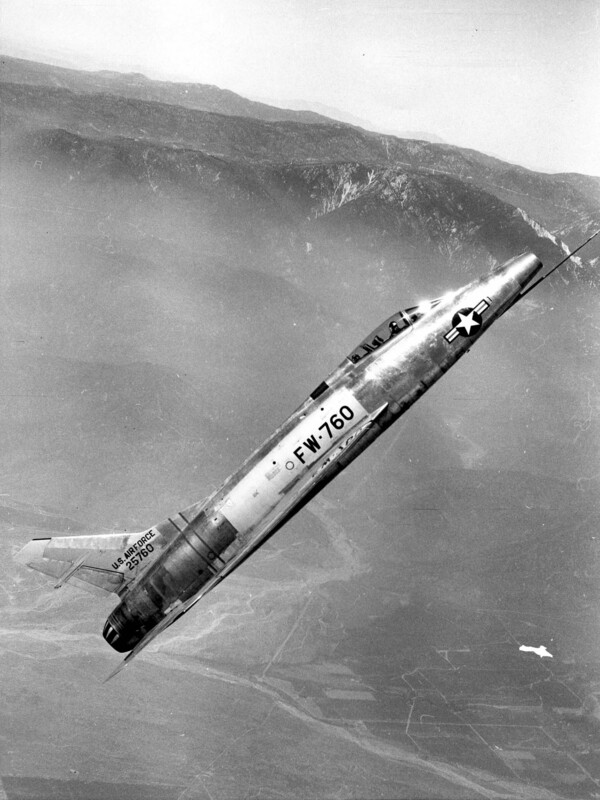 The Super Sabre had encountered Inertial Roll Coupling. It went out of control and then disintegrated. Its nose folded over the windshield, crushing Welch in his seat. The vertical fin broke away. The ejection seat fired but because of the supersonic speeds the parachute was shredded. Welch was still alive when rescue teams arrived. He died while being flown to a hospital by helicopter. To increase maximum speed of transonic and supersonic airplanes during the late 1940s and early 1950s, their wings and tail surfaces were made smaller in order to decrease aerodynamic drag. At the same time, the fuselage became longer and the placement of engines, armament, landing gear, fuel, etc., within the fuselage concentrated the airplane’s mass near its center. While the gyroscopic effects of the turbojet engine contributed some degree of longitudinal stability, the torque effect made rolls to the left occur more easily, but with a higher rate than a roll to the right. 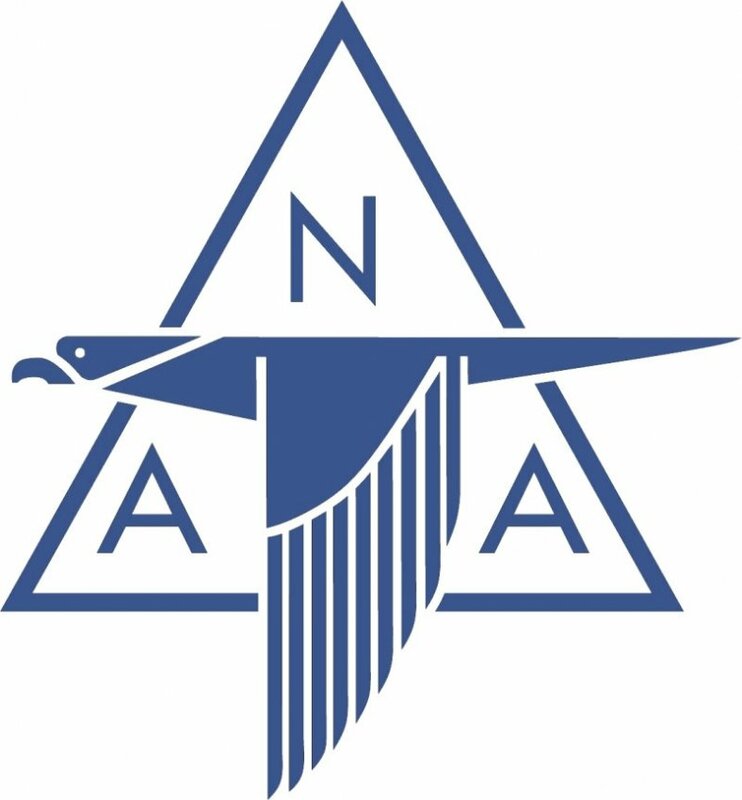 The resistance to a change in attitude—inertia—decreased at the same time that the control surfaces’ ability to control the airplanes’ attitude also decreased. The airplanes became unstable. 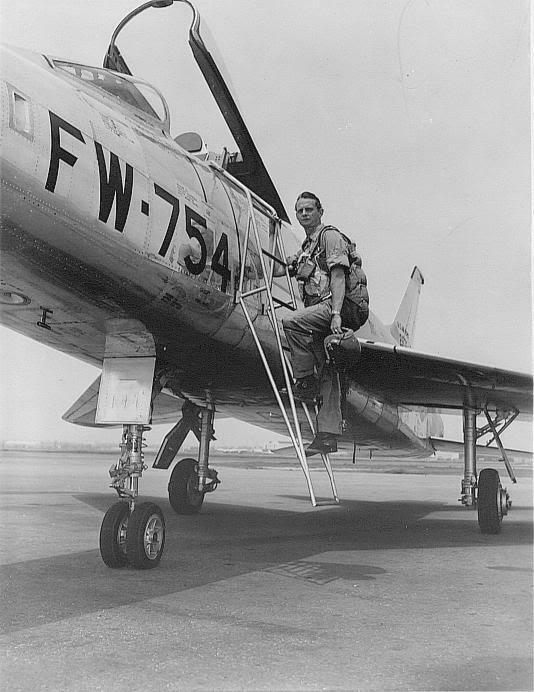 Following the death of George Welch, NACA High Speed Flight Station research test pilot Albert Scott Crossfield spent three months conducting flight tests of the F-100A, demonstrating its inertial roll coupling characteristics using three different vertical fins. 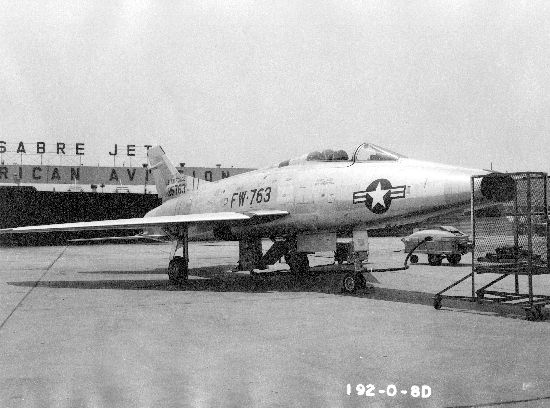 F-100A-5-NA 52-5778 was Crossfield’s test aircraft. The North American Aviation F-100 Super Sabre was designed as a supersonic day fighter. Initially intended as an improved F-86D and F-86E, the “Sabre 45” soon developed into an almost completely new airplane. The fuselage incorporated the “area rule,” a narrowing in the fuselage width at the wings to increase transonic performance, similar to the Convair F-102A. The Super Sabre had a 49° 2′ sweep to the leading edges of the wings and horizontal stabilizer. The total wing area was 385.2 square feet (35.79 square meters). The wings had an angle of incidence of 0°, with no twist or dihedral. The ailerons were placed inboard on the wings and there were no flaps, resulting in a high stall speed in landing configuration. The horizontal stabilizer was moved to the bottom of the fuselage to keep it out of the turbulence created by the wings at high angles of attack. The F-100A had a distinctively shorter vertical fin than the YF-100A. The upper segment of the vertical fin was swept 49° 43′. 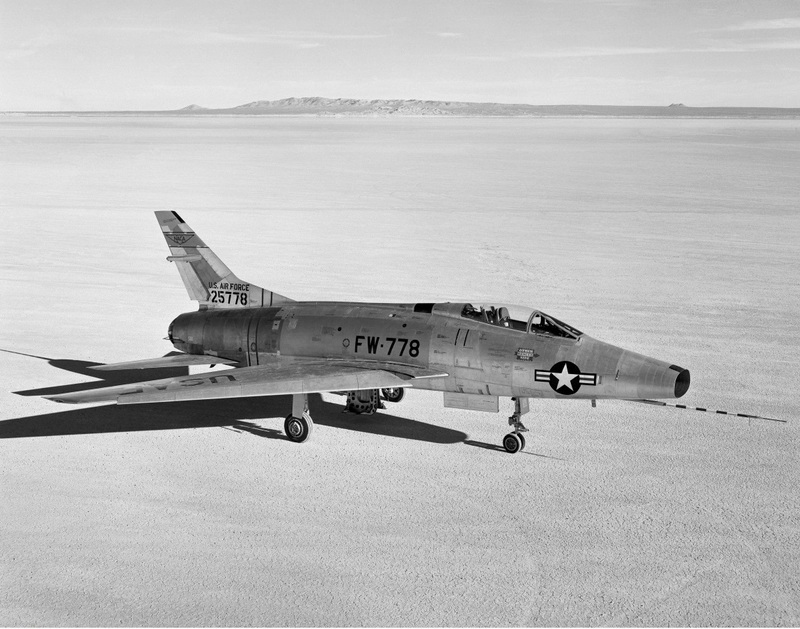 There were two service test prototypes, designated YF-100A, followed by the production F-100A series. 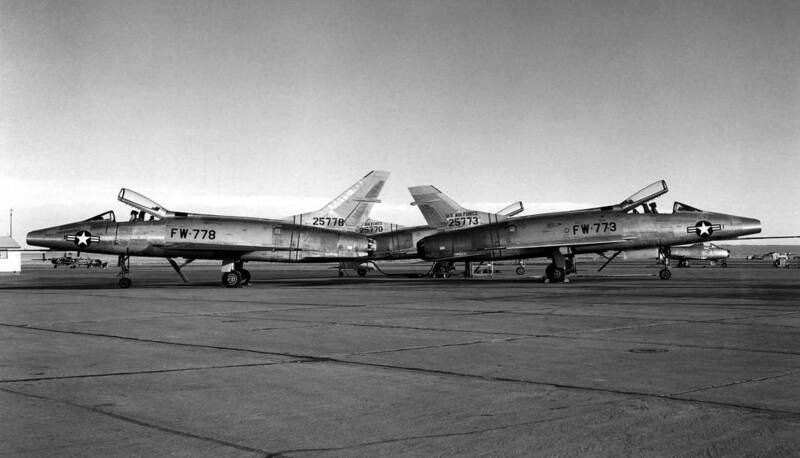 The first ten production aircraft (all of the Block 1 variants) were used in the flight testing program. 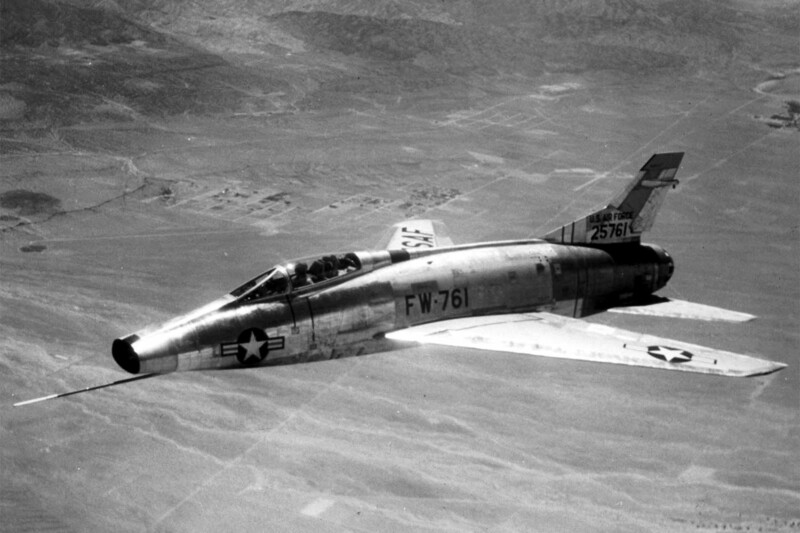 The F-100A Super Sabre was 47 feet, 1¼ inches (14.357 meters) long with a wingspan of 36 feet, 6 inches (11.125 meters). With the shorter vertical fin, the initial F-100As had an overall height of 13 feet, 4 inches (4.064 meters), 11 inches (27.9 centimeters) less than the YF-100A. The F-100A had an empty weight of 18,135 pounds (8,226 kilograms), and its maximum takeoff weight was 28,971 pounds (13,141 kilograms). It had an internal fuel capacity of 744 gallons (2,816 liters) and could carry two 275 gallon (1,041 liter) external fuel tanks. The early F-100As were powered by a Pratt & Whitney Turbo Wasp J57-P-7 afterburning turbojet engine. The J57 was a two-spool axial-flow turbojet which had a 16-stage compressor section (9 low- and 7 high-pressure stages) and a 3-stage turbine (2 high- and 1 low-pressure stages). Its continuous power rating was 8,000 pounds of thrust (35.586 kilonewtons). The Military Power rating was 9,700 pounds (43.148 kilonewtons) (30-minute limit). Maximum power was 14,800 pounds (43.148 kilonewtons) with afterburner (5-minute limit). The engine was 20 feet, 9.7 inches (6.342 meters) long, 3 feet, 3.9 inches (1.014 meters) in diameter, and weighed 5,075 pounds (2,303 kilograms). Later production aircraft used a J57-P-39 engine. The Super Sabre was the first U.S. Air Force fighter capable of supersonic speed in level flight. It could reach 760 miles per hour (1,223 kilometers) at Sea Level. (Mach 1 is 761.1 miles per hour at Sea Level, 1,224.9 kilometers per hour, under Standard Atmospheric Conditions.) The maximum speed of the F-100A was 759 knots (873 miles per hour/1,406 kilometers per hour)—Mach 1.32—at 35,000 feet (10,668 meters). Its service ceiling was 47,500 feet (14,478 meters). The fighter’s combat radius was 402 nautical miles (463 statute miles/745 kilometers). The maximum ferry range with external fuel was 1,124 nautical miles (1,493 statute miles/2,082 kilometers). The F-100 was armed with four M-39 20 mm autocannons, capable of firing at a rate of 1,500 rounds per minute. The ammunition capacity of the F-100 was 200 rounds per gun. North American Aviation built 199 F-100A Super Sabres at its Inglewood, California, plant before production shifted to the F-100C fighter bomber variant. 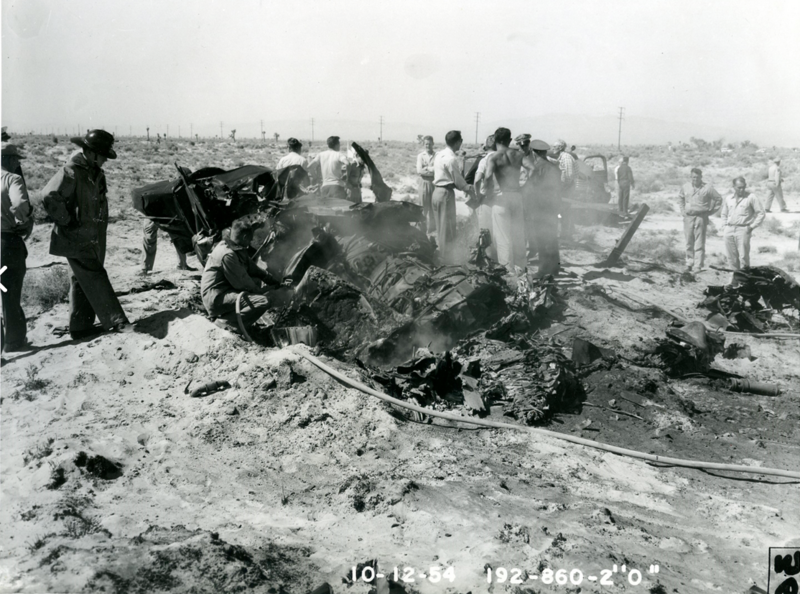 Approximately 25% of all F-100As were lost in accidents. George Welch was born George Lewis Schwartz, Jr., in Wilmington, Delaware, 10 May 1918. He was the first of two sons of George Lewis Schwartz, a chemist at the Dupont Experimental Station in Wilmington, and Julia Welch Schwartz. His parents changed his surname to Welch, his mother’s maiden name, so that he would not be effected by the anti-German prejudice that was widespread in America following World War I. He studied mechanical engineering at Purdue University, Indiana, and enlisted in the Army Air Corps in 1939. Welch graduated from pilot training at Kelly Field, Texas, and on 4 October 1940, was commissioned as a second lieutenant, U.S. Army Air Corps. George S. Welch is best remembered as one of the heroes of Pearl Harbor. He, along with Second Lieutenant Kenneth M. Taylor, were the only two fighter pilots to get airborne from Haleiwa Auxiliary Airfield during the Japanese surprise attack on Hawaii, 7 December 1941. Flying a Curtiss P-40B Warhawk, he shot down three Aichi D3A “Val” dive bombers and one Mitsubishi A6M2 Zero fighter. Taylor also shot down four Japanese airplanes. For this action, Lieutenant General Henry H. “Hap” Arnold recommended the Medal of Honor, but because Lieutenants Welch and Taylor had taken off without orders, an officer in their chain of command refused to endorse the nomination. 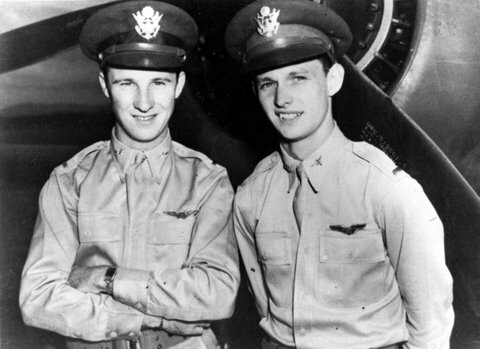 Both fighter pilots were awarded the Distinguished Service Cross. During the War, Welch flew the Bell P-39 Airacobra and Lockheed P-38 Lightning on 348 combat missions. He had 16 confirmed aerial victories over Japanese airplanes and rose to the rank of Major. 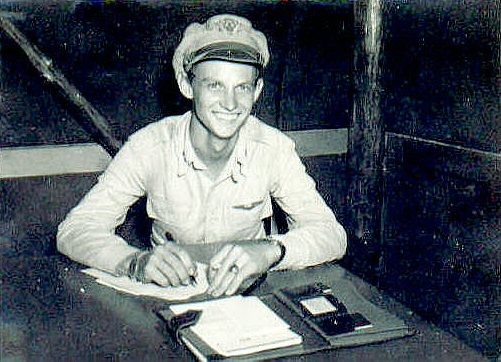 In addition to the Distinguished Service Cross, George Welch was awarded the Silver Star, the Distinguished Flying Cross with two oak leaf clusters (three awards), the Air Medal with one oak leaf cluster (two awards), the Presidential Unit Citation with two oak leaf clusters (three awards), American Defense Service medal with one service star, American Campaign Medal, Asiatic-Pacific Campaign Medal with one silver and one bronze star (six campaigns), and the World War II Victory Medal. Suffering from malaria, George Welch was out of combat and recuperating in Australia. There he met Miss Janette Alice Williams and they were soon married. Welch returned to the United States with his new wife. They had a son, Giles, born in October 1947. Their home was in Brentwood, California. North American Aviation approached General Arnold to recommend a fighter pilot who could bring his combat experience to testing new fighters. Welch was one of two that General Arnold suggested. The general authorized Welch’s release from active duty so that he could join North American. Welch held the rank of major, Air Reserve, from 13 November 1944 to 1 April 1953. Welch went on to test fly the North American P-51H Mustang, FJ-1 Fury, F-86 Sabre and F-100 Super Sabre. George Welch made the first flight of the XP-86 prototype, 1 October 1947. There is some evidence that on that flight, and during a subsequent flight on 14 October, Welch exceeded the speed of sound while in a dive. 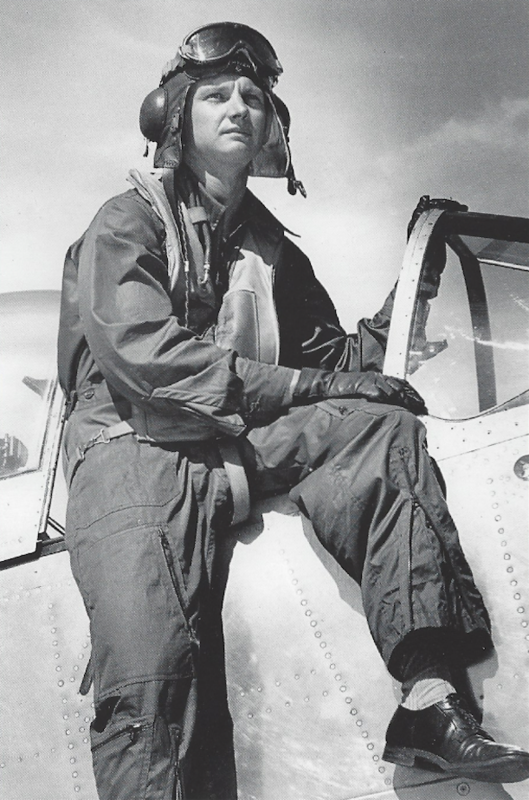 It has been said that during the Korean War, while teaching U.S. Air Force pilots how to best use the F-86 Sabre, he shot down several enemy MiG-15 jet fighters. 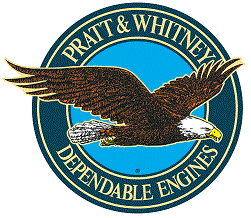 George S. Welch is buried at the Arlington National Cemetery, Section 6, Site 8578-D.
¹ Recommended: Coupling Dynamics in Aircraft: A Historical Perspective, by Richard E. Day, Dryden Flight Research Center, Edwards AFB, California. NASA Special Publications 532, 1997.